Most of us agree that inclusion is important. However, we might be unsure how to activate this positive ideal in our daily professional practices. Where to begin when so much change and transformation seems needed? This week, we are excited to feature the Welcoming Guidelines that the LGBTQ Alliance, a professional network of the American Alliance of Museum (AAM), has been developing over the last couple years. These guidelines can certainly inform and help facilitate action. Thank you to Renae Youngs for introducing Incluseum readers to these guidelines that have been gathered in this document. Reposted from The Incluseum blog, an online forum advocating that inclusion become an integral priority for all museums and flourish through supportive community relationships. 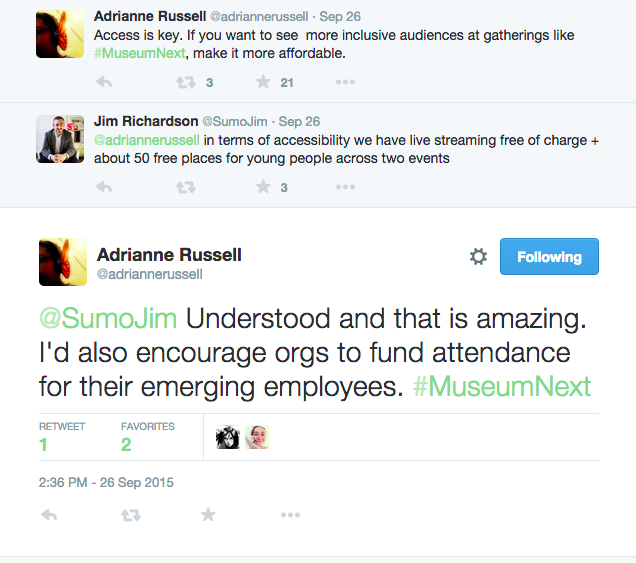 On September 25-26, I participated in MuseumNext’s first stateside convening at the Indianapolis Museum of Art (IMA). Since 2009, MuseumNext has organized annual conferences in cities across Europe to highlight current best practices and future directions for the museum field. Starting with Indianapolis this year, MuseumNext will hold conferences annually in the fall in the States and in the spring in Europe. This fall’s topic was “Building Inclusive Museums” (not to be confused with the International Conference on the Inclusive Museum — though it’s great to see the topic gaining increasingly widespread attention).Through two days of jam-packed conference sessions, the themes explored ranged from sharing power and authority with museum audiences to fostering more inclusive hiring and labor practices within institutions. In this blog post, I’ll share two of my greatest takeaways from the conference. There were at least as many definitions of inclusion as there were speakers at the podium. Something that came up again and again was the idea of sharing power and responsibility with communities beyond museum walls. For example, Independent Curator and and Public Engagement Consultant Sarah Schultz used the Open Field project, which she founded at the Walker Art Center in Minneapolis, as a case study to explain how inviting “community members” (a phrase that merits further unpacking) into the process of creating public programming is essential to creating an inclusive space. Similarly, in the realm of exhibition development, Smithsonian Curator Masum Momaya advocated engaging community members “from concept to closing.” Manager of Digital Content/Social Media Lori Byrd-McDevitt shared a case study of a “community blogging” initiative at the Children’s Museum of Indianapolis.The museum demonstrated “radical trust” by allowing selected bloggers free rein to create content for their website. 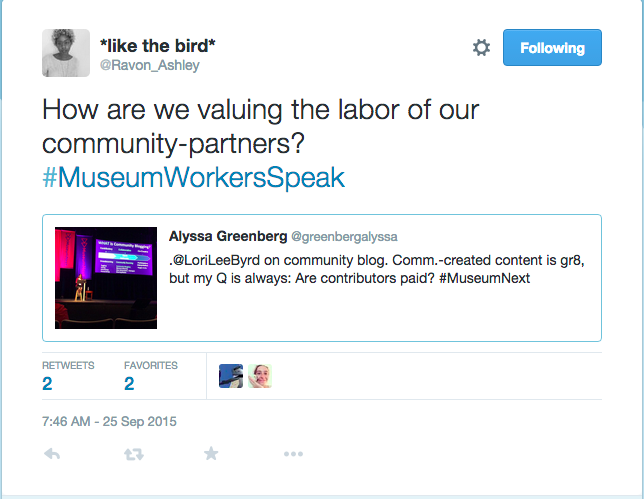 Byrd-McDevitt anticipated that questions of compensation might arise in the audience, and she was clear that community bloggers received the benefit of blogging experience as well as perks such as meals, goodie bags, access to museum events, and museum membership — but not financial compensation. The question of financial compensation for community partners arose again during Nina Simon’s presentation, when she described a community engagement project wherein “homeless volunteers” worked on landscaping the Evergreen Cemetery, which is owned by the Santa Cruz Museum of Art and History. Momaya followed up on this topic in the Q&A following Simon’s talk, asking how an activist museum director can address wage disparity and privilege. Though Simon’s talk was called “Fighting for Inclusion,” she responded that the issues of working conditions described by Momaya were “not our fight” — a viewpoint with which I disagree. When museum staff members partner with community members to do museum work, and there’s an imbalance in voice or compensation or decision-making power, that partnership can reinforce rather than challenge social inequalities. If we are to continue promoting inclusion as a value within our field, we will need to put more thought into how to address this tension. How can we persuade museum workers at all levels — including museum leaders — that equitable working conditions are central to inclusion? Museum Evangelist Adrianne Russell pointed out that the high registration cost (tickets were in the $400 range) (not to mention travel costs!) 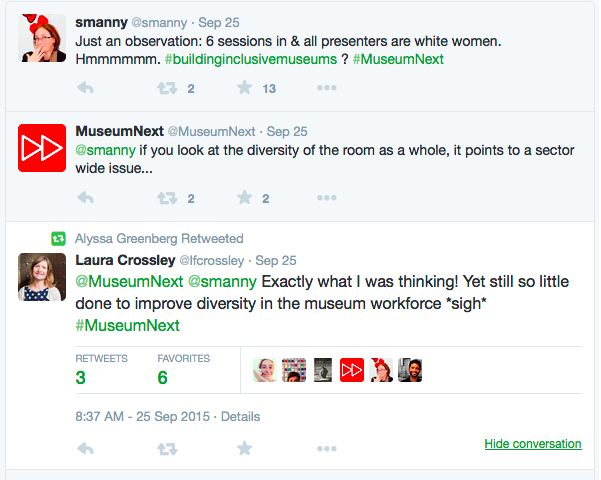 kept MuseumNext attendance out of reach of many museum workers. I was fortunate to be able to attend the conference with the help of a senior colleague, who let me ride with her from Chicago and even subsidized my lodging! This amazing, above-and-beyond support for an emerging professional from a leader in the field was instrumental — but not everyone can be so lucky. I concur with Russell that while the free livestreaming went quite far in making the conference accessible to a wider audience, the impact of having a more diverse community of museum workers in the room would have had a significant impact on the conference discourse, especially if the conference had had a more audience-engaged format. Many people followed the stream and engaged the conference topics over Twitter, but having their voices physically present to ask questions and address the presenters in person would be a huge improvement. By far, the most radical and provocative presentations were delivered by women of color — specifically, Co-Founder of Museum Hue Monica O. Montgomery, Momaya, and Ruffin. Those are the presentations I encourage you, readers, to watch or rewatch. Throughout the conference, most of the presentations delivered by white women were operating in the “success story” mode pervasive in the museum field, flattering participants’ current understandings of inclusion without pushing further. Why was the critical role of pushing the field to work harder for inclusion seemingly left to women of color alone? And since they did speak up, will we listen? You can also read this post in its entirety on The Incluseum website, including additional citations and notes. The Incluseum is a blog and project to promote social inclusion in museums coordinated by Rose Paquet Kinsley and Aletheia Wittman. Art Museum Teaching and The Incluseum are co-hosting this post in hope that Emily’s work and observations can catalyze a broader dialogue among museum professional and educators. Arts education is a complex system today, as public schools–in conjunction with Parent Teacher Associations (PTA’s), local arts organizations, teaching artists, art specialists, volunteers, museums, school boards, the state legislature, and national policy–work in collaboration to deliver the arts to children. This intertwined web of arts advocates is a reaction to the worsening reality that the arts are no longer a stable piece of public school curriculum, with many schools excluding the arts altogether. The arts have had to react, and find a solution for inclusion in this landscape of severe budget cuts and focus on math and literacy. Rather than demanding to be included in the daily curriculum, with a mantra of “Do not cut the arts,” the arts have forged new partnerships to keep arts education alive in some public schools. Let me paint the picture for you as best I can in an effort to make arts education more transparent, so that you can see how you fit into this landscape, and where there is room for improvement. Schools, in the way they deliver (or do not deliver) arts education to children are highly diverse. This diversity means that public school A in Los Angeles, CA, is very different from public school B in San Francisco, CA, based on school population, size, parent involvement, student engagement and achievement, and of course, arts education. In the same way, public school B in San Francisco is also drastically different from public school C in San Francisco. Public schools are increasingly centered on the local, as arts education funding (at least in California) is distributed by local school districts. This distribution of funds, while on the surface entirely equitable, is not. While each public school may get an equitable amount (based on school population and size, among other factors), PTA’s can quickly change the picture of arts education. More affluent schools tend to have more active PTA’s, and usually raise additional funds for academic programs that they value (and this sometimes includes the arts). Moreover, schools can decide how best to use the money they do receive—does this mean hiring a teaching artist for a week-long intensive for third graders in dance instruction, or does it mean buying new music stands and replacing outdated instruments, or does it mean using these funds to add to the overall school budget to help save a teacher from getting laid off (and hoping that teacher involves her students in arts learning)? As you can see, arts education in public schools gets complicated quickly, and the picture can also seem rather bleak. However, I believe we are in a golden age of opportunity and collaboration. Much progress is still to be made in terms of equitable and engaged learning with the arts, however. Interestingly (as based on my thesis research), a local elementary school in San Francisco with a high-poverty student population was a target of grant funding for the arts and actually had so many arts programs that the teachers were concerned about having enough time to teach other subjects. Comparatively, another elementary school in San Francisco, with an average socioeconomic student population (neither affluent, nor high-poverty) had very limited arts education, despite a very vocal and committed PTA full of arts advocates. 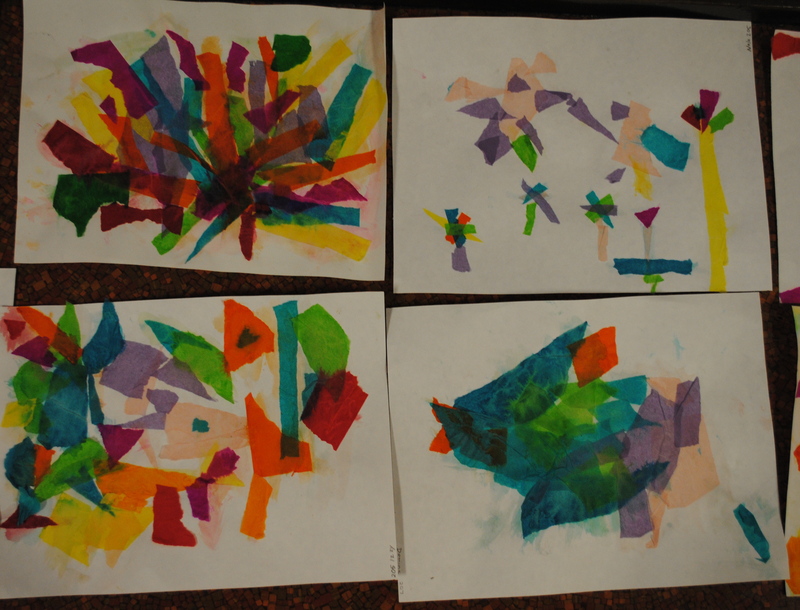 Lastly, another elementary school in San Francisco, with an affluent student population and a highly involved and highly funded PTA, had hired a full-time art specialist (a very rare occurrence, I can assure you) to teach sequential visual art to all students for an hour each week. The national trend, however, is still that those students in the highest poverty areas are the ones with the least amount of arts education, and are those that could most benefit from them. There are substantial connections and programs to be cultivated with schools and outside organizations to bring quality arts education to all children. The arts, more than any other academic subject, is an area pioneering these partnerships. One successful example is seen at the Children’s Creativity Museum (CCM) here in San Francisco. At CCM, public and private elementary-school through high-school students can participate in creative field trips such as claymation, music studio, or innovation lab taught by museum educators. High school students can work at the museum in the C.I.T.Y. (Creative Inspiration Through Youth) Teen Program, a paid employment opportunity, helping run exhibits and getting job experience in an arts non-profit environment. In addition, CCM has a growing outreach program, teaching claymation workshops at after-school programs in the Bay Area. While CCM’s programs are quite established and the link to childhood and youth arts education is evident, I know of other arts institutions that are taking baby steps toward inclusion. For example, some art museums now have field trip guides (sometimes just a folded pamphlet) for elementary students to learn about famous artworks in understandable language. 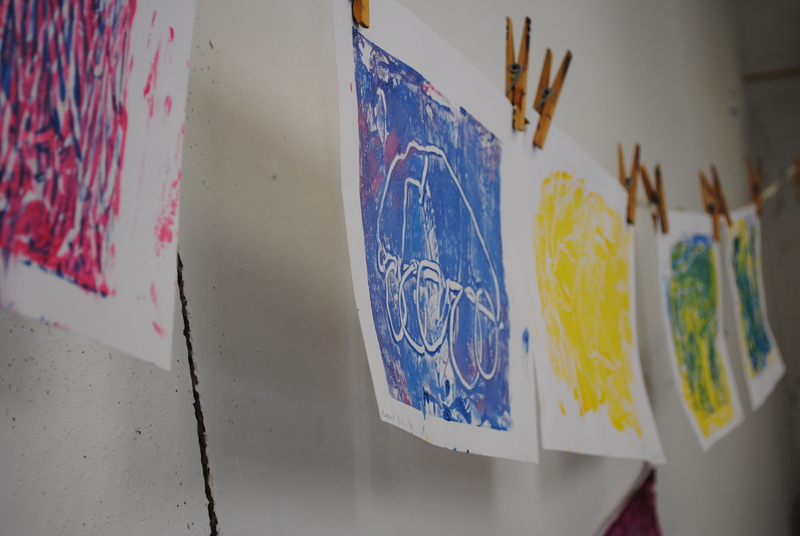 Arts advocates, one school at a time, are inserting the arts, sometimes briefly, to change the landscape of learning. Hopefully this trend will continue to gain momentum. I know that it takes a whole ecosystem of arts advocates, from those working at the national and state level who make policy that supports equitable and quality education, to those at the local level, who raise additional funds for arts education to be taught in public schools, to teachers who understand the importance of the arts, to researchers who publish this knowledge, to people who have been impacted by the arts who share their stories to create more arts advocates. Wouldn’t it be wonderful to have a full-time arts specialist in every school, in addition to a visiting teaching artist and relevant field trips to museums, as well as after-school arts programs by local arts organizations? Just think of all those students could accomplish! How are different art museums sustaining partnerships with public schools in high poverty areas? Are museums offering comprehensive arts education that represents art across cultures and communities? With more dialogue about these questions, art museums can become more inclusive parts of this “landscape” themselves. Arts Education Partnership, “Champions of Change: The Impact of the Arts on Learning.” Edward B. Fiske, editor, (Washington D.C., 1999). “Critical Links: Learning in the Arts and Students Academic and Social Development.” Richard J. Deasy, editor. (Washington D.C., 2002). National Assembly for State Arts Agencies in collaboration with Arts Education Partnership. “Critical Evidence: How the Arts Benefit Student Achievement.” Sandra S. Ruppert. (Washington D.C., 2006). National Assembly of State Arts Agencies. “Why Should Government Support the Arts?” (Washington D.C., 2010). President’s Committee on the Arts and the Humanities. “Reinvesting in Arts Education: Winning America’s Future Through Creative Schools.” (Washington D.C., 2011). EMILY SHALLMAN has a BA in Elementary Art Education with a Washington State Teaching Certificate and Reading Endorsement from Western Washington University, and a MA in Urban Studies from the San Francisco Art Institute. Emily has experience as an Art Specialist, teaching visual art to grades K-5. Her MA thesis researched the history of arts education in public schools, as well as case-study analysis of the inequality of arts education based on socioeconomic factors. Currently, she works at SFAI, serves as a Board Fellow for the California Alliance for Arts Education and runs a children’s illustration blog www.illustrationsby.com. She lives in San Francisco, CA with her husband and two cats.